Journal of the House of Commons: Volume 5, 1646-1648. Originally published by His Majesty's Stationery Office, London, 1802. Die Lunæ, 28 Augusti, 1648. Taking of Duke Hamilton, &c.
Resolved, &c. That this House doth accept of the Sum of One thousand Five hundred Twenty-two Pounds and Sixteen Shillings, for a Fine, for the Delinquency of William Helyar, of East Coker in the County of Somersett, Esquire: His Offence, That he was in Arms against the Parliament: He rendered upon the Articles . . . Exeter: His Estate, in Fee, in Possession, per Annum, Three hundred Seventy-five Pounds Eighteen Shillings and Nine-pence; in old Rents, per Annum, Thirty-seven Pounds Five Shillings and Seven-pence; for Two Lives, per Annum, Seventy-two Pounds; for Three Lives, per Annum, Two hundred Seventy-seven Pounds; for Twelve Years, per Annum, One Pound; for Two Lives, after Two Years, per Annum, Fifty-nine Pounds; for Thirtyfour Years, per Annum, Sixty Pounds; for Half a Year, One hundred Forty Pounds; personal Estate, Thirty Pounds: Out of which issues, for One Life, per Annum, One hundred Thirty-eight Pounds: Which, being allowed, leaves the Fine, at a Tenth, One thousand Five hundred Twenty-two Pounds and Sixteen Shillings. An Ordinance for granting a Pardon unto William Helier, of East Coker in the County of Somersett, Esquire, for his Delinquency, and for taking off the Sequestration of his Estate, was this Day read; and, upon the Question, passed; and ordered to be sent to the Lords for their Concurrence. Resolved, &c. That this House doth accept of the Sum of One thousand Five hundred Pounds, for a Fine, for the Delinquency of Sir Peter Richaut, of Aylesford in the County of Kent, Knight: His Offence, That he lest his Dwelling, &c. His Son, being authorized by him, did Petition in April 1646, That he might be admitted to compound for his Father's Delinquency; and, by an Order of the House of Commons, of Twenty-eighth of January 1646, was accordingly admitted to Composition: His Estate, in Possession, is, per Annum, Three hundred Sixty Pounds, charged with a Rent-charge of Three hundred Pounds per Annum, for One Life; for One Life, per Annum, Five hundred Ninety-eight Pounds; in personal Estate, One thousand Eight hundred Sixty-six Pounds: For which a Fine was set; and Three thousand Six hundred Seventy-six Pounds, which he accounted desperate, was to be compounded for as he should recover it, or any Part thereof: There is issuing Six Pounds Thirteen Shillings and Four-pence, per Annum, for ever: Which leaves the Fine, at a Sixth, One thousand Five hundred Pounds. An Ordinance for granting a Pardon unto Sir Peter Richaut, of Aylesford in the County of Kent, Knight, for his Delinquency, and for taking off the Sequestration of his Estate, was this Day read; and, upon the Question, passed; and ordered to be sent to the Lords for their Concurrence. Resolved, &c. That this House doth accept of the Sum of Three hundred Forty-one Pounds Nine Shillings and Eight-pence, for a Fine, for the Delinquency of John Johnson, of Newarke in the County of Nottingham, Alderman: His Delinquency, That he assisted the Forces raised against the Parliament: He rendered upon these Articles: His Estate, in Fee, in Possession, per Annum, Fifty-five Pounds Eleven Shillings; in Debts, One thousand Forty-nine Pounds: For which his Fine, at a Sixth, is Three hundred Forty-one Pounds Nine Shillings and Eight-pence. An Ordinance for granting a Pardon unto John Johnson, of Newark in the County of Nottingham, Alderman, for his Delinquency, and for taking off the Sequestration of his Estate was this Day read; and, upon the Question, passed; and ordered to be sent to the Lords for their Concurrence. Resolved, &c. That this House doth accept of the Sum of Four hundred Pounds, for a Fine, for the Delinquency of Arthur Heveningham, of Heveningham in the County of Suffolk, Gentleman: His Offence, That he was in Arms against the Parliament: He rendered before December 1645: His Estate, in Fee, in Possession, per Annum, Two hundred Pounds: For which his Fine, at a Tenth, is Four hundred Pounds. An Ordinance for granting a Pardon unto Arthur Heveningham, of Heveningham, in the County of Suffolk, Gentleman, for his Delinquency, and for taking off the Sequestration of his Estate, was this Day read; and, upon the Question, passed; and ordered to be sent to the Lords for their Concurrence. Resolved, &c. That this House doth accept of the Sum of Four hundred Pounds, for a Fine, for the Delinquency of Sir Henry Clark, of Pleshy in the County of Essex, Knight: His Offence, That he was in Arms against the Parliament: He rendered upon the Articles of Truro: His Estate, in Fee, in Possession, per Annum, One hundred Twenty Pounds; in Reversion, after his Mother, per Annum, One hundred Twenty-two Pounds: Out of this issues Forty Pounds, per Annum, for One Life: For his Wife's Life, he hath, per Annum, Seventy-four Pounds: For which his Fine, at Two Years Value, is Four hundred Pounds. 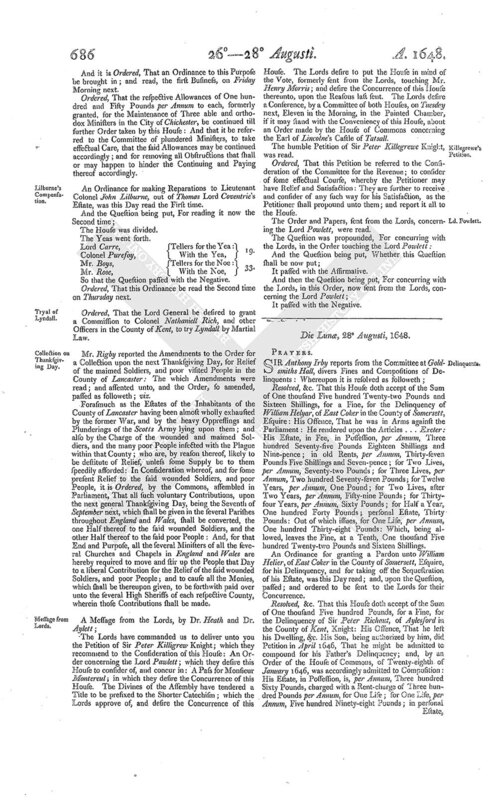 An Ordinance for granting a Pardon unto Sir Henry Clarke, of Pleashy in the County of Essex, Knight, for his Delinquency, and for taking off the Sequestration, of his Estate, was this Day read; and, upon the Question, passed; and ordered to be sent to the Lords for their Concurrence. Resolved, &c. That this House doth accept of the Sum of Eight hundred Seventy-five Pounds and Fourteen Shillings, for a Fine, for the Delinquency of Wm. Cartwright, of Mintridge in the County of Hereford, Esquire: His Offence, That he was in Arms against the Parliament: He rendered before December 1645: His Estate, in Fee and Fee-tail, per Annum, Six hundred Pounds Eight Shillings and Nine-pence; in Reversion, per Annum, Forty Pounds: Out of which issues, for ever, per Annum, Two Pounds Thirteen Shillings and Five-pence; for One Life, per Annum, One hundred Seventy-three Pounds Six Shillings and Eight-pence; for Two Lives, per Annum, Fifty Pounds; also a Debt of One thousand Two hundred Pounds, charged upon the Land: Which, being allowed, leaves the Fine, at a Tenth, Eight hundred Seventy-five Pounds and Fourteen Shillings. An Ordinance for granting a Pardon unto Wm. Cartwright, of Mintridge in Com' Hereford, Esquire, for his Delinquency, and for taking off the Sequestration of his Estate, was this Day read; and, upon the Question, passed; and ordered to be sent unto the Lords for their Concurrence. Resolved, &c. That this House doth accept of the Sum of Seven hundred Eighteen Pounds, for a Fine, for the Delinquency of Sir William Ingleby, of Ripley in the County of York, Knight: His Offence, That he was in Arms against the Parliament: He rendered before December 1645: His Estate, in Fee, in Possession, per Annum, Eighty Pounds; for Life, per Annum, Five hundred Sixty-two Pounds Ten Shillings: Out of which issues, for One Life, per Annum, Four Pounds: Which, being allowed, leaves the Fine, at a Tenth, Seven hundred Eighteen Pounds. An Ordinance for granting a Pardon unto Sir William Ingleby, of Ripley in the County of York, Knight, for his Delinquency, and for taking off the Sequestration of his Estate, was this Day read; and, upon the Question, passed; and ordered to be sent to the Lords for their Concurrence. Resolved, &c. That this House doth accept of the Sum of Three hundred Seventy-two Pounds Nine Shillings, for a Fine, for the Delinquency of John Bois, of Oldstock in the County of Somersett, Gentleman: His Offence, That he was in Arms against the Parliament: He rendered in April 1646: His Estate, in Fee, in old Rents, per Annum, Five Pounds Ten Shillings and Six Pence; in Fee Tail, per Annum, One hundred and Thirty Pounds; more, in Fee Tail, in old Rents, per Annum, Thirty Pounds; for Three Lives, per Annum, Forty Pounds; for One Life, after a Life, per Annum, Forty Pounds: Out of which issues, for Three Lives, per Annum, Four Pounds: Which, being allowed, leaves the Fine at a Sixth, Three hundred Seventy-two Pounds Nine Shillings. An Ordinance for granting a Pardon unto John Bois, of Oldstock in the County of Somersett, Gentleman, for his Delinquency, and for taking off the Sequestration of his Estate, was this Day read; and, upon the Question, passed; and ordered to be sent to the Lords for their Concurrence. Resolved, &c. That this House doth accept of the Sum of One hundred Forty-eight Pounds, for a Fine, for the Delinquency of Edward Palfreyman, of Lusby in the County of Lincoln, Gentleman: His Offence, That he adhered to the Forces raised against the Parliament: He rendered upon the Articles of Newark: His Estate, in Fee, in Possession, per Annum, Forty-six Pounds Eight Shillings; after One Life, per Annum, Nineteen Pounds: Out of which issues, for ever, per Annum, Eighteen Shillings and Nine-pence: And there is also a Debt of One hundred Pounds, charged upon his Lands: Which, being allowed, leaves the Fine, at a Sixth, One hundred Fortyeight Pounds. An Ordinance for granting a Pardon unto Edward Palfreyman, of Lusby in the County of Lincoln, Gentleman, for his Delinquency, and for taking off the Sequestration of his Estate, was this Day read; and, upon the Question, passed; and ordered to be sent to the Lords for their Concurrence. Resolved, &c. That this House doth accept of the Sum of Seven hundred Forty-seven Pounds and Ten Shillings, for a Fine, for the Delinquency of Peter Leicester the younger, of Nether Tabley in the County of Chester, Esquire: His Offence, That he was a Commissioner of Array, and left his Habitation, and went to Oxford: He rendered upon those Articles: His Estate, in Fee, in Possession, per Annum, Three hundred Thirtyone Pounds Five Shillings; in Rack Rents, per Annum, Thirty-one Pounds Eight Shillings and One Peny; in old Rents, per Annum, Seventy-five Pounds Fourteen Shillings and Three-pence: Out of which issues, for One Life, per Annum, Two hundred and Ninety Pounds; for ever, per Annum, Three Pounds Three Shillings; and Six hundred Pounds, charged upon his Lands: Which, being allowed, leaves the Fine, at a Tenth, Seven hundred Forty-seven Pounds and Ten Shillings. 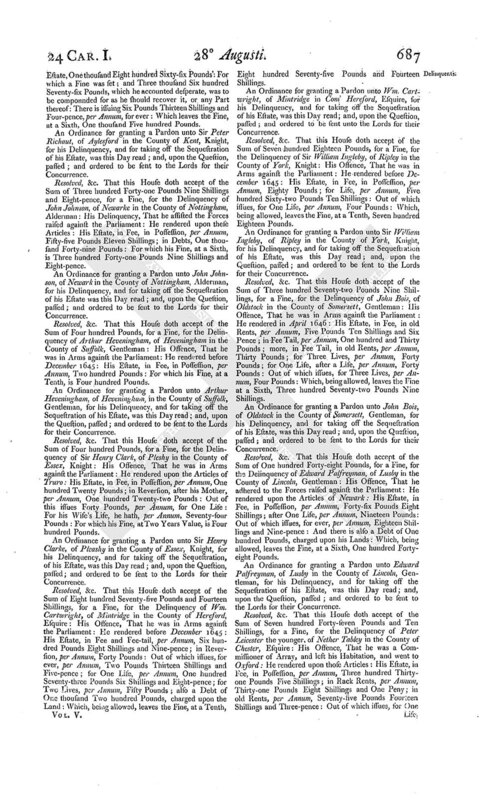 An Ordinance for granting a Pardon unto Peter Leicester, of Nether Tabley in the County of Chester, Esquire, for his Delinquency, and for taking off the Sequestration of his Estate, was this Day read; and, upon the Question, passed; and ordered to be sent to the Lords for their Concurrence. Resolved, &c. That this House doth accept of the Sum of Five hundred and Fifty Pounds, for a Fine, for the Delinquency of Richard Marshall, of Newark in the County of Nottingham, Gentleman: His Offence, That he was in Arms against the Parliament: He rendered upon the Articles of Newark: His Estate, in Fee Tail, per Annum, One hundred Twenty-three Pounds Six Shillings; for Three Lives, per Annum, Eighty Pounds; in Goods and Debts, One hundred and Ten Pounds: For which his Fine, at a Sixth, is Five hundred and Fifty Pounds. 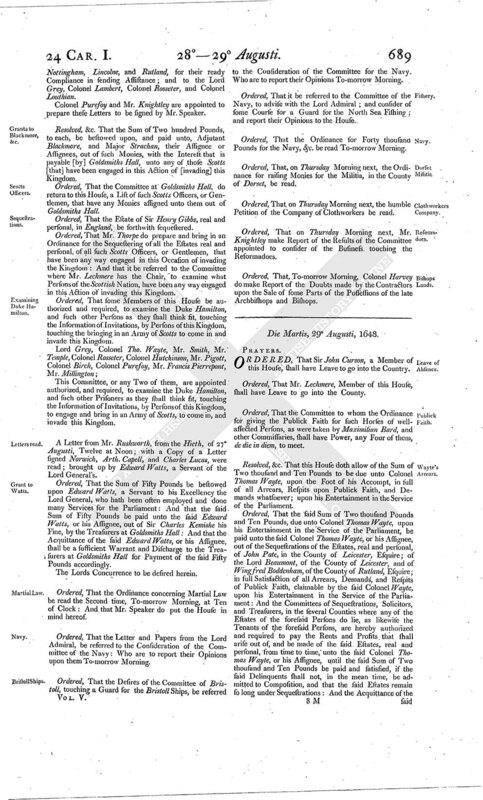 An Ordinance for granting a Pardon unto Richard Marshall, of Newark in Com' Nottingham, Gentleman, for his Delinquency, and for taking off his Sequestration, was this Day read, and, upon the Question, passed; and ordered to be sent to the Lords for their Concurrence. Resolved, &c. That this House doth accept of the Sum of Seven hundred Fourscore and One Pounds, for a Fine, for the Delinquency of William Salisbury, of Bachumbidd in the County of Denbigh, Esquire, and Charles Salisbury his Son: Their Delinquency, That they were in Arms against the Parliament: They rendered upon the Articles of Denbigh: Their Estate, in Fee, in Possession, Two hundred Thirty-eight Pounds; in Reversion, after One Life, per Annum, Three hundred Pounds; personal Estate, Fifty Pounds: For which the Fine, at a Tenth, is Seven hundred Fourscore and One Pounds. An Ordinance for granting a Pardon unto Wm. Salisbury, of Bachumbidd in the County of Denbigh, Esquire, and Charles Salisbury his Son, for their Delinquency, and for taking off the Sequestration of their Estates, was this Day read; and, upon the Question, passed; and ordered to be sent to the Lords for their Concurrence. Resolved, &c. That this House doth accept of the Sum of Eight thousand Three hundred and Forty-five Pounds, for a Fine, for the Delinquency of Wm. Marquis of Hertford: His Offence, That, being a Peer of this Realm, he deserted the Parliament, and went to Oxford: He rendered upon the Articles of the Surrender of that Place: His Estate, in Fee, in Demesne, and certain Rents, per Annum, One hundred Twenty-eight Pounds Ten Shillings; in old Rents, in Fee, per Annum, Fiftyfive Pounds Eight Shillings and Six-pence; for Life, in Demesne, and certain Rents, per Annum, Two thousand One hundred Fifty-seven Pounds Six Shillings and Fourpence; for Life, in old Rents, per Annum, One thousand Five Pounds Eighteen Shillings and Two-pence; in Reversion, after One Life, in Demesne, per Annum, Six hundred One Pounds Seventeen Shillings and Tenpence; and, in old Rents, after One Life, per Annum, Six hundred Thirty-seven Pounds Eight Shillings and Seven-pence; personal Estate, Six hundred and Ninety Pounds: Out of which issues, for One Life, per Annum, One hundred and Seventy Pounds: Which leaves the Fine, at a Tenth, according to the Articles of Oxon, Eight thousand Three hundred and Forty-five Pounds. An Ordinance for granting a Pardon unto Wm. Marquis of Hertford, for his Delinquency, and for taking off the Sequestration of his Estate, was this Day read, and, upon the Question, passed; and ordered to be sent to the Lords for their Concurrence. Ordered, That the Committee at Goldsmiths Hall do forthwith certify, to this House, a List of the Names of all such Delinquents, whose Rents are secured in the Tenants Hands, that have not paid in the Moiety of their Fines upon their Compositions. Ordered, That no Pardon, granted to any Delinquent, shall extend to pardon any Offence committed by any Delinquent, after the Day of their Composition and Fine set for their Delinquency at Goldsmiths Hall. The humble Petition of Thomas Lord Cromwell, Baron of Ouckham in the County of Rutland, was this Day read. Resolved, &c. That this House doth accept of the Sum of One hundred Pounds more than the Lord Cromwell has paid in at Goldsmiths Hall, in full Discharge of the whole Fine set upon the Lord Cromwell, for his Delinquency. Ordered, That the Sum of Forty Pounds be charged upon the Receipt at Goldsmiths Hall, and paid unto Ellen, the Wife of Wm. Hithcock, Quartermaster of Horse; and Cassandra Carpenter, the Wife of William Carpenter Trooper: Whose several and respective Acquittances shall be a sufficient Warrant and Discharge to the Treasurers at Goldsmiths Hall, for Payment thereof accordingly. A Letter from the Lord Grey, and Colonel General Lambert, of 25 Augusti, 1648, from Uttexeter, relating the taking of Duke Hamilton, and Three thousand Five hundred Horse with him, was this Day read; and likewise a List of the Prisoners. Colonel Thomas Wayte, who was a chief Actor in all this Service, related the Particulars of the whole Proceedings. Resolved, &c. That the Thanks of this House be given to the Lord Grey, and Colonel Thomas Waite, for their great good Service; and that this House doth very well approve of what they have done in this Service. Mr. Speaker accordingly did presently give the Thanks of this House to Colonel Thomas Wayte, a Member of this House, in his Place. Ordered, That the Accompts of Colonel Thomas Waite's Arrears be brought in, and considered of, on Saturday Morning next. Major Smithson, and the Lord Greye's Secretary, that brought up the Letters and List from Uttexeter, were called in; and did deliver in the List. Ordered, That the Sum of Two hundred Pounds be bestowed upon Major Smithson, who hath done very faithful and gallant Service ever since these Wars, and more particularly in this late great utter Defeat of the Scotts whole Army; and Three hundred Pounds forthwith paid unto him, upon Account, in part of his Arrears: And that the said whole Sum of Five hundred Pounds be forthwith paid unto the said Major Smithson, or his Assignee, as aforesaid, by the Treasurers at Goldsmiths Hall, out of the Fine of Sir Charles Kemishe: And that the Acquittance of the said Major Smithson shall be a sufficient Warrant and Discharge unto the said Treasurers at Goldsmiths Hall, for Payment of the said Sum of Five hundred Pounds accordingly. Ordered, That the Sum of One hundred Pounds be bestowed upon Mr. Edward Evans, Secretary to the Lord Grey, and paid unto him or his Assignee, out of the Sequestrations of the County of Leicester': And the Committee for Sequestrations of that County are required forthwith to pay unto the said Mr. Edward Evans the said Sum of One hundred Pounds: And that the Acquittance of the said Mr. Evans, or his Assignee, shall be a sufficient Warrant and Discharge to the said Committee, and their Treasurers, for Payment of the said Sum of One hundred Pounds accordingly. Ordered, That Letters of Thanks be sent unto the respective Committees of Northampton, Coventry, Leicester, Nottingham, Lincolne, and Rutland, for their ready Compliance in sending Assistance; and to the Lord Grey, Colonel Lambert, Colonel Rosseter, and Colonel Louthian. Colonel Purefoy and Mr. Knightley are appointed to prepare these Letters to be signed by Mr. Speaker. Resolved, &c. That the Sum of Two hundred Pounds, to each, be bestowed upon, and paid unto, Adjutant Blackmore, and Major Strachan, their Assignee or Assignees, out of such Monies, with the Interest that is payable [by] Goldsmiths Hall, unto any of those Scotts [that] have been engaged in this Action of [invading] this Kingdom. Ordered, That the Committee at Goldsmiths Hall, do return to this House, a List of such Scotts Officers, or Gentlemen, that have any Monies assigned unto them out of Goldsmiths Hall. Ordered, That the Estate of Sir Henry Gibbs, real and personal, in England, be forthwith sequestered. Ordered, That Mr. Thorpe do prepare and bring in an Ordinance for the Sequestering of all the Estates real and personal, of all such Scotts Officers, or Gentlemen, that have been any way engaged in this Occasion of invading the Kingdom: And that it be referred to the Committee where Mr. Lechmere has the Chair, to examine what Persons of the Scottish Nation, have been any way engaged in this Action of invading this Kingdom. Ordered, That some Members of this House be authorized and required, to examine the Duke Hamilton, and such other Persons as they shall think fit, touching the Information of Invitations, by Persons of this Kingdom, touching the bringing in an Army of Scotts to come in and invade this Kingdom. 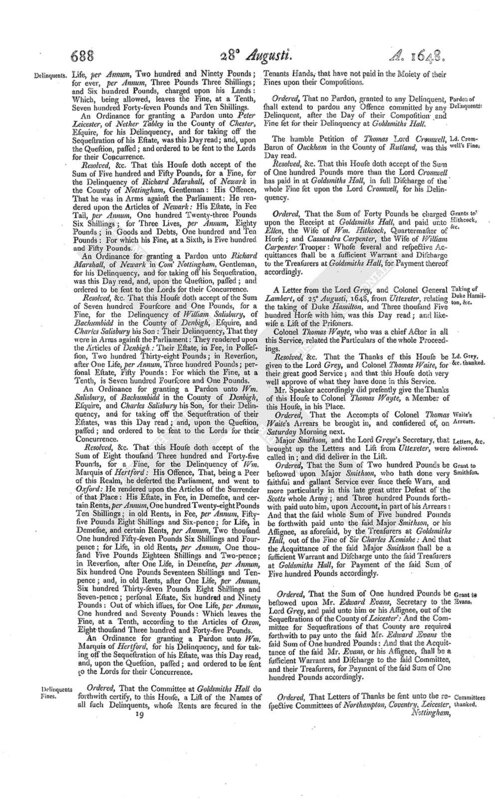 This Committee, or any Two of them, are appointed authorized, and required, to examine the Duke Hamilton, and such other Prisoners as they shall think fit, touching the Information of Invitations, by Persons of this Kingdom, to engage and bring in an Army of Scotts, to come in, and invade this Kingdom. A Letter from Mr. Rushworth, from the Hieth, of 27 Augusti, Twelve at Noon; with a Copy of a Letter signed Norwich, Arth. Capell, and Charles Lucas, were read; brought up by Edward Watts, a Servant of the Lord General's. Ordered, That the Sum of Fifty Pounds be bestowed upon Edward Watts, a Servant to his Excellency the Lord General, who hath been often employed and done many Services for the Parliament: And that the said Sum of Fifty Pounds be paid unto the said Edward Watts, or his Assignee, out of Sir Charles Kemishe his Fine, by the Treasurers at Goldsmiths Hall: And that the Acquittance of the said Edward Watts, or his Assignee, shall be a sufficient Warrant and Discharge to the Treasurers at Goldsmiths Hall for Payment of the said Fifty Pounds accordingly. Ordered, That the Ordinance concerning Martial Law be read the Second time, To-morrow Morning, at Ten of Clock: And that Mr. Speaker do put the House in mind hereof. Ordered, That the Letter and Papers from the Lord Admiral, be referred to the Consideration of the Committee of the Navy: Who are to report their Opinions upon them To-morrow Morning. Ordered, That the Desires of the Committee of Bristoll, touching a Guard for the Bristoll Ships, be referred to the Consideration of the Committee for the Navy. Who are to report their Opinions To-morrow Morning. Ordered, That it be referred to the Committee of the Navy, to advise with the Lord Admiral; and consider of some Course for a Guard for the North Sea Fishing; and report their Opinions to the House. Ordered, That the Ordinance for Forty thousand Pounds for the Navy, &c. be read To-morrow Morning. Ordered, That, on Thursday Morning next, the Ordinance for raising Monies for the Militia, in the County of Dorset, be read. Ordered, That on Thursday Morning next, the humble Petition of the Company of Clothworkers be read. Ordered, That on Thursday Morning next, Mr. Knightley make Report of the Results of the Committee appointed to consider of the Business touching the Reformadoes. Ordered, That, To-morrow Morning, Colonel Harvey do make Report of the Doubts made by the Contractors upon the Sale of some Parts of the Possessions of the late Archbishops and Bishops.